Quick Thoughts: The Age of Miracles isn’t an easy ride. Karen Thompson Walker’s slow boil apocalypse is a melancholy, almost anti-coming of age tale that is equal parts gripping and frustrating. While it left me ultimately unsatisfied and uneasy, the path to this final destination was lavishly and intricately created. When it comes to the end of the world, sometimes I prefer the whimper. So much of the Post Apocalyptic fiction I read in my younger years where all about the bang. A plague, bomb, alien invasion or killer asteroid comes along and instantly wipes out billions upon billions of our fellow inhabitance of Earth. I think with the invention of nuclear bombs, the idea of instant annihilation seemed more probable. Yet, as more and more we begin to realize that gradual causes are more of a threat to ending us as a species then a sudden jolt, it’s being reflected in our fiction. With ecological, political, social, economic and scientific issues cropping up in our newspapers on a daily basis, there is almost a feeling that we are amidst a slow boil apocalypse, only waiting for the last catalyst to drop. I think handling this idea properly is one of the toughest tasks of the apocalyptic author. When the apocalypse is cut and dry, we can get right to the roving bandits, looting and rise of demagogues. Yet, when the issues are murky, it’s tough to find the line between a normal regression of society and an apocalypse. When do the people really begin to realize that this is the end? When the prices of gas skyrocket? When food and electricity become uncertain commodities? At some point there has to be a point of no return, and it’s important for an author taking on a slow boil apocalypse to define that moment for the characters of their tale. In Karen Thompson Walker’s The Age of Miracles, the earth’s rotation begins to slow, incrementally extending the day. For 11 year old Julia, the announcement of The Slowing is met with an almost restrained excitement. Yet, as her world begins to transform to the changing planet, Julia begins to see how the new world will affect her directly. As society begins to shift, Julia’s quiet observations serves as our guide, giving us an intimate tour through the evolution of mankind as they deal with their potential demise. Walker has created a fascinating tableau for her often moody tale of the end of the world. There is definite melancholy tone and our preteen protagonist displays her life in a series of lasts. With many coming of age tales, which The Age of Miracles echoes, we see a series of firsts, the first kiss, the first job, the first taste of independence, yet with Julia, despite experiencing firsts, her story focuses on her lasts, the last time seeing a friend, the last time eating a grape. This contrast is striking and heartbreaking, and makes the reader want to really feel for the character. Yet, for me, it was hard at times to really place Julia’s voice. I think part of this was due to the fact it was future Julia telling the tale of 11 year old Julia, and this makes it hard to translate between her initial perspectives, and those filtered through times. This gives Julia an ageless quality that blunts some of the effectiveness of her tale of loneliness, young love, and naive innocence. Also, Walker has a tendency for foreshadowing that never really pays off. She mentions certain initiatives and alludes to actions being taken, yet they seem to fall to the wayside, never to be explored again. 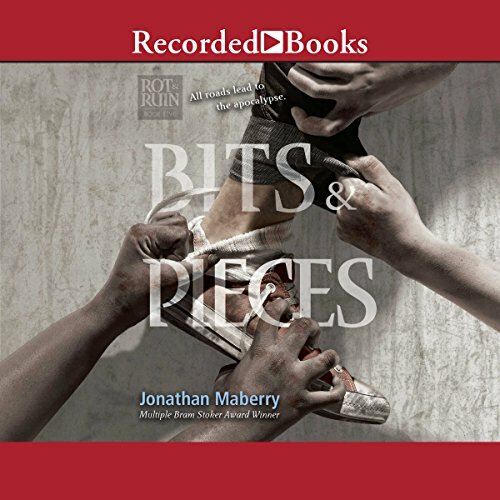 While his makes some sense on a sociological level, in a society where many people just seem to give up, on a plotting level, it often became frustrating for me as a reader. Yet, despite these problems, Walker managed to keep me mesmerized with her lush prose, and melancholy tone. While I didn’t totally connect with Julia, I felt connected to her world and much of my frustration came from wanting to know more. The Age of Miracles isn’t an easy ride. Karen Thompson Walker’s slow boil apocalypse is a melancholy, almost anti-coming of age tale that is equal parts gripping and frustrating. While it left me ultimately unsatisfied and uneasy, the path to this final destination was lavishly and intricately created. 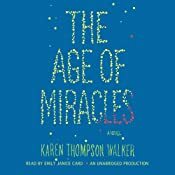 One of the big reasons I choose The Age of Miracles was to experience a solo narration by Emily Janice Card. To be quite honest, Card’s vocal style isn’t especially unique. Her voice and tone are similar to many narrators doing fine work today, Yet, Cards understanding of the material and ability to make smart choices in her narration really sets her apart. Card reads The Age of Miracles with a slow, deliberate tone the echoes the gradual breakdown of Walker’s word. Card manages to make you feel for the characters she voices. You can hear Julia’s loneliness and despair, as well as the brief moments of uplift she experiences throughout the novel. Card’s reading contributes to the melancholy mood, at times giving the prose an almost dream like quality. Her performance was quite affecting. I found my mood echoing that of the characters of the novel, which is good for the novel but wasn’t necessarily good for my overall attitude. It would be hard for me to say that I loved The Age of Miracles, or even that I really enjoyed the experience, but I did find it to be a fascinating, but emotionally draining listen. Note: This review is part of my weekly Welcome to the Apocalypse Series.